Montana Democratic Gov. 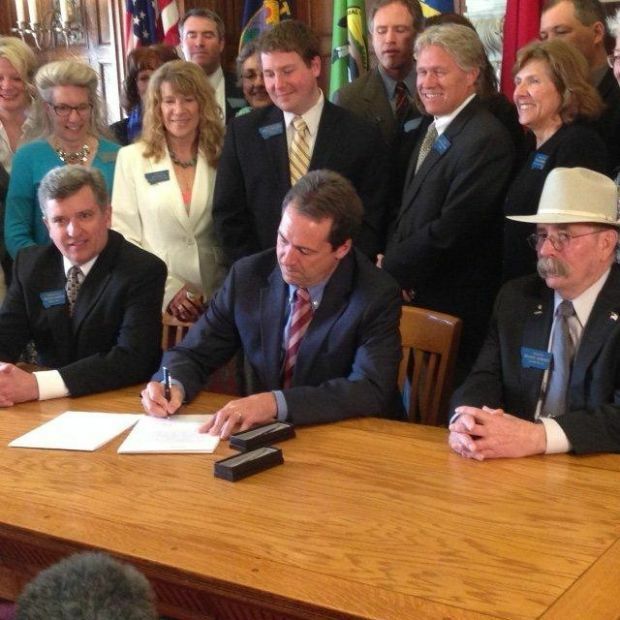 Steve Bullock signs a bill requiring more disclosure surrounding campaign donations on April 22, 2015, at the Capitol in Helena, while Rep. Frank Garner, left, and Sen. Duane Ankney look on. Gov. 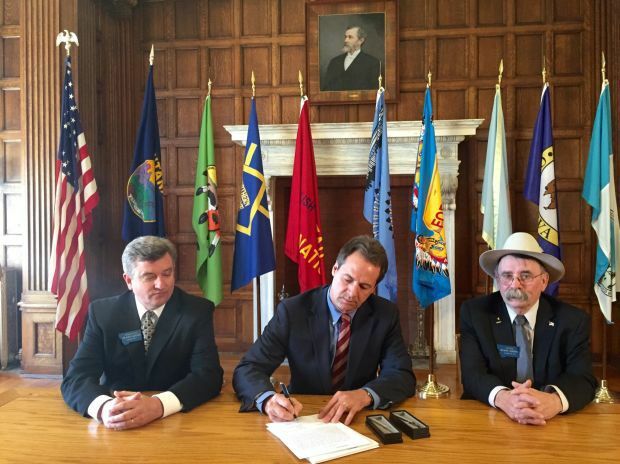 Steve Bullock signs into law Senate Bill 289, to tighten Montana's campaign finance laws. On right is the bill's sponsor, Sen. Duane Ankney, R-Colstrip. On left is Rep. Frank Garner, R-Kalispell, who led debate on bill in House. Supporters of the bill and others who worked on it stand behind them. HELENA — Gov. Steve Bullock signed into law Wednesday a major bill to tighten Montana’s campaign finance laws to require anonymous so-called “dark money” groups to report how they are spending money in state political races. The Democratic governor signed the bill flanked by two Republicans, Sen. Duane Ankney of Colstrip, who sponsored the bill, and Rep. Frank Garner of Kalispell, who led the debate in the House. Later, a number of legislators who supported the bill and others who worked on it stood behind the governor and two lawmakers for another bill signing. “When it comes to Montanans as individuals having control of our elections, this is the most significant day in the last 112 years since Montanans passed the Corrupt Practices Act,” Bullock told a large crowd in the Governor’s Reception Room. That initiative, passed by voters in 1912, helped wrest the state’s political power from the Copper Kings, the mining barons who had exerted enormous influence over state politics, Bullock said. That initiative prohibited corporations from making independent expenditures in state political campaigns. A group known as Western Tradition Partnership sued to have the Corrupt Practices Act found unconstitutional. Bullock as attorney general represented the state, which won at the Montana Supreme Court in 2011. The next year, however, the U.S. Supreme Court summarily reversed the Montana court to strike down the law. Bullock said he, Ankney and Garner all have been targeted by the lies spread by dark-money groups. “Montana is now back to having legitimate elections instead of the auctions we — for a brief time — held every two years,” he said. “And we are on our way back to having elected officials that are finally accountable to the citizens they represent instead of some special interest and their bundles of dark money. Ankney said he was proud that the bill passed after the Senate “squashed” a similar bill in 2013. He recounted talking to one legislator this year who wasn’t sure he was going to support SB289. The crowd cheered loudly at that line. He was targeted earlier this session by Americans for Prosperity-Montana, part of a conservative political group founded by billionaires David and Charles Koch of Wichita, Kan. That came after Garner refused to sign a card from the group pledging to oppose Medicaid expansion. As a result, the group, without notifying him, sent critical postcards to notify its supporters of a town meeting in Kalispell. Garner and his supporters showed up uninvited to the meeting, which local press accounts said did not go well for AFP-M.
On the drive back to Helena that night, Garner said he decide to support the bill to fight dark money. Require disclosure of any spending on “electioneering communications” made within 60 days of when voting begins in an election. Require disclosure from all groups making political expenditures or contributions during an election cycle. Increase the frequency and length of time reporting is required during an election cycle. After the bill signing, the Montana Republican Party issued a press statement saying that even with passage of the new law, Bullock, as chair of the Democratic Governors Association, still will be able to raise and spend undisclosed, unlimited corporate cash. “Bullock only believes in transparency as long as he doesn’t have to tell Montanans where all his undisclosed, unlimited corporate cash is coming from,” the Republican Party said. Montana’s new campaign reform rules were added to the books Tuesday, despite objections from state lawmakers who say the rules go too far.